Over two nights, Rova members will team up with long-time associates and first-time co-conspirators to present 4 sets of duo performances. Hear the Rovas work outside their ‘comfort’ zones to investigate new possibilities with their fellow travelers. Likeminded multi-instrumentalists Steve Adams and Vinny Golia have been playing together since 1988 in a wide variety of ensembles, though rarely as a duo. The C4NM concert will feature Steve’s new 30 minute piece A Mysterious Abundance of Quinces for bass flute, contra alto clarinet and electronics, as well as pieces from their CD Circular Logic. Steve Adams joined Rova in 1988, and is also a member of the Vinny Golia Large Ensemble, the Matt Small Ensemble, and the Bill Horvitz Band, as well as leading his own groups. He has been a member of Composers in Red Sneakers, a Boston composers’ collective, and the bands Birdsongs of the Mesozoic and Your Neighborhood Saxophone Quartet. Adams has released six recordings under his own name on the 9 Winds and Clean Feed labels, the latest of them being Surface Tension with bassist Ken Filiano and drummer Scott Amendola. Adams’s compositions have been performed at the Bang on a Can festival and The Works festival presented by Meet the Composer/Reader’s Digest, and recorded by the violin/marimba duo Marimolin. He is a graduate of the School of Contemporary Music in Brookline, Massachusetts, and studied composition with Alan Crossman, Christopher Yavelov, and Thomas Oboe Lee, saxophone with David Birkin, and Indian music with Peter Row and Steve Gorn. Adams received a California Arts Council Fellowship in 2000 and a Meet the Composer/Reader’s Digest grant in 1993, and teaches at Mills College. 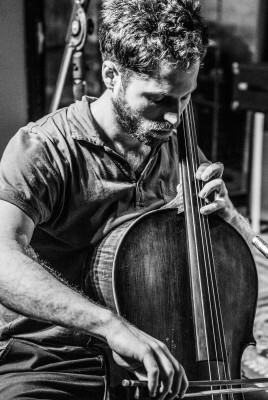 Teddy Rankin-Parker is an American cello player based in Oakland, CA, who specializes in improvisation and avant-garde music. Rankin-Parker currently works in a wide variety of areas, including solo performance, chamber orchestras, performance art, free improvised settings, electro acoustic music and composition. Teddy has performed, toured, and/or recorded with dozens of artists, including the International Contemporary Ensemble (ICE), Iron & Wine, Glen Hansard, Primus, the Chicago Sinfonietta, Joffrey Ballet, AACM, Chicago Folks Operetta, Opera Cabal, Renee’ Bakers Modern Orchestra Project, and Nicole Mitchell’s Black Earth Ensemble.